Elliot Quest is a charming platformer that’s filled with adventure and mystery as you travel to various biomes collecting crystals and power-ups all the while trying to save the world and yourself. I played the game using both Joy-Con as one controller. You move with the analog stick, attack with Y, jump with B, and use your spells with A. It was a little backward for me as I’m used to A being the main button. Even though you can change the controls, I stuck with the default ones. It wasn’t hard getting used to them. 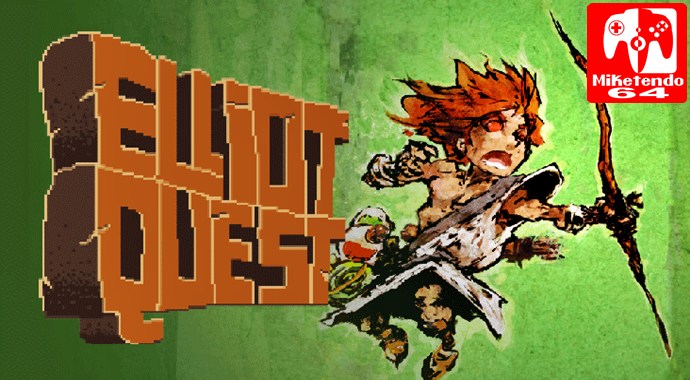 Elliot Quest is a simple game to play, yet there’s a lot to do. Your main weapon is a bow and arrows which you can upgrade the farther you get into the game. You gain spells such as wind and fire along the way as well as gather other power-ups such as a double jump or the dash boots. The more enemies you kill, the more experience points you get. You soon level up and are able to add skills: strength, wisdom, agility, health, and accuracy. Then you can upgrade those skills five times each. These skills help your shooting rate and make the attack stronger, allows you to regenerate hearts or magic points, run faster, and more. As Elliot, you wander around the map, Urele, from one area to the next. You battle enemies, upgrade your skills and weapons, gain power-ups and magic spells, defeat bosses, and gather crystals. These crystals, if you collect all 11 of them, unlock four new bosses as well as a new dungeon. They’re easy enough to come across during your normal playthrough, but some are actually hidden pretty well. There are some areas throughout the game that are blocked off by a stone in which you need a certain amount of crystals – either 4, 7, or 11 – to pass. If you have the right amount, the stone door will open and show a new area or a useful item. This added a little extra to the map. You go from one area to the next, finding the dungeons and going through them, however there were plenty of places you couldn’t reach to quite fill out the whole map of the dungeon or the area before it. This was because you needed a certain power up, such as the stomp boots that allowed triple-jumping to get to high places, a stone door needing crystals blocked the way, or you needed a certain magic spell. These out of reach places usually held an item such as a heart piece or magic jar or opened a shortcut from one area to the next. It left room to always go back to previous places and explore a little more. I only wish the map was a little easier to manuever. An exclamation point appears above Elliot’s head when you can enter an area and you can occasionally run into a wandering enemy on the map. However, you can go just about anywhere so it’s not clear where you’re supposed to go next. This isn’t a bad thing depending on how you like to play games, but it can get time consuming as you wander around wondering where to go and what to do next. I had played this game when it came out for the Nintendo 3DS and honestly, there’s not too much of a difference. definitely enjoyed playing the game on my TV rather than the small handheld screen. However, I missed utilizing the bottom screen of my 3DS as that showed the map at all times. It’s certainly not difficult to hit “pause” to look at the map, but I liked it much better when I could just glance down and keep walking. The graphics look pixelized. Elliot is small and a simple fellow, but the enemies are easily distinguished and recognizable. Elliot doesn’t seem to see himself as all that special and most everything in the world is bigger than him. I find that to be an interesting bout of symbolism with the way the story goes (whether that was done on purpose or not). The map itself is simple, but each area inside the map is well done. There are various biomes to go through such as a desert, forest, mountains, and more. These areas lead to the temples: a wind temple, fire temple, stone temple, and ice temple. Each one has its own color palette, even if it may be similar to the area before it. The backgrounds are pretty as well. Sometimes it’s hard to tell if there’s something you can jump on, but most often than not, you can stand on top of it. If you can stand on top of it, that mostly means there’s something special up high. I think they’re well designed and the music for each temple is well done. Actually, the music for the whole game is well done. It has an adventure kind of beat to it. This game was inspired by Zelda II: The Adventure of Link and a lot of the music reminded me of that. Still, the music made you feel as though you were doing something important, which you are. The sound effects were top notch as well. Hitting an enemy and setting boxes on fire was satisfying and a lot of the other sound effects, such as bouncing on an object or coming across a save stone were fun to listen to. Elliot doesn’t know what’s going on. Cara has disappeared, the Guardians have seemed to abandoned them, the Satar is coming, and Elliot can’t die no matter how hard he tries. It’s certainly a mystery. Elliot will sometimes talk to himself as you progress further into the game voicing his thoughts on what’s going on. Flashbacks will happen (or maybe his life flashing before his eyes?) and other characters will appear giving him some insight bit by bit throughout the game. Rasa, a mysterious character, tells Elliot that he can’t die because the Satar has chosen him as his next vessel. Now it’s up to Elliot to save the island as well as himself. This is clever for two reasons. One reason being that they tied the save points into the story. Stone slabs are save points in the game and all you have to do is walk by it for its eye to glow blue. If you die, you end up back in that spot. You’re not just saving your progress of the game, Elliot is actually stuck in his world. The second reason being is that there are a few choices you can make throughout the game which will give you either a good ending, a neutral ending, or an evil ending. Elliot Quest is a fun game. It’s full of mystery as you, the protagonist, doesn’t even know what’s going on. You just know you need to help save everyone. The gameplay is unique and the power-ups are loads of fun and cleverly woven into the story. While I don’t want the game to hold my hand, I would have liked a clearer map to at least show me what I’ve already completed. Overall, it’s a well crafted game and I’m sure I’ll pick it back up again in the future.